In collaboration with the Ministry of Health, on October 1st Médecins Sans Frontières/Doctors Without Borders (MSF) extended its reconstructive plastic surgery programme at Gaza’s Nasser hospital in Khan Younis to Al-Shifa hospital. After assessing the situation and determining medical needs in Gaza, in July 2010 Médecins Sans Frontières decided in collaboration with the local health authorities to open a reconstructive plastic surgery and post-operative care programme at Nasser hospital. The programme provides treatment to victims of trauma, domestic accidents, burns and other injuries and aims to help patients regain optimum use of their limbs. “We hope that our work at Al-Shifa Hospital will increase the number of patients receiving treatment and reduce the Ministry of Health’s waiting list”, says Tommaso Fabbri, Médecins Sans Frontières Head of Mission in Jerusalem. Patients on the programme need reconstructive surgery, a very specific field of medicine with which Gaza requires support. Apart from a few private surgeons and clinics, Al-Shifa and Nasser hospitals are the only facilities able to provide this kind of treatment. The blockade implemented in 2007 resulted in over 450 patients having to wait from 12 to 18 months for their operations. 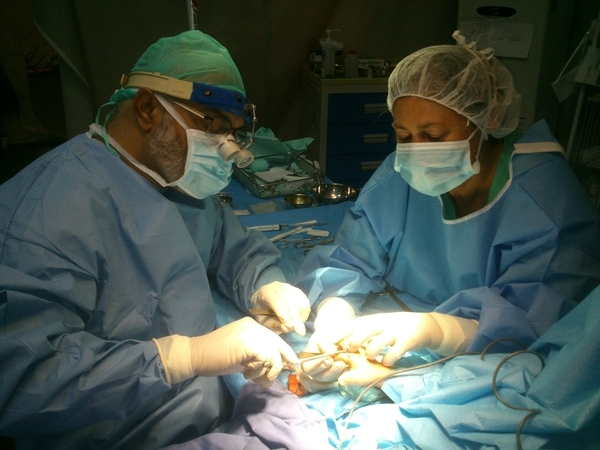 Teams of international Médecins Sans Frontières staff - surgeons, theatre nurses and anaesthetists - travel several times a year to Gaza and work in close cooperation with the teams at Nasser and Al-Shifa hospitals. October 1st saw the launch of the first surgical programme at Al-Shifa hospital and a total of 18 procedures are scheduled. Over 80% involve children. “The aim is to share knowledge and skills, both in reconstructive surgery and postoperative care. The first two days of the programme were devoted to preoperative examinations and then the following seven to the procedures themselves”, explains Médecins Sans Frontières surgeon Dr Mahesh Prabhu from the field in Gaza. There are two types of surgical intervention: plastic surgery and specialist hand surgery. The Médecins Sans Frontières teams performed 126 procedures - 63% on children - at Nasser hospital between January and September 2013. After their operations, patients are routinely referred to a Médecins Sans Frontières clinic specialised in hand and burns postoperative care. In 2012, patients benefited from some 7,000 dressing and physiotherapy sessions. Physiotherapy plays a key role in rehabilitation treatment for patients who have been operated on as it helps them to heal more quickly and suffer less pain. There is a room set aside for hand physiotherapy in the Médecins Sans Frontières clinic. Most patients are children and we want to help each and every one of them regain optimum use of their hands. Médecins Sans Frontières also treats patients referred by Ministry of Health and other facilities at the clinic. In addition to the surgery programme, in June 2013 Médecins Sans Frontières joined forces with the Ministry of Health to provide intensive care training at Al-Shifa hospital for doctors from several Gaza hospitals. And, after a supply problem resulted in a shortage of insulin, in September 2013 Médecins Sans Frontières donated to the Ministry of Health enough of the medication to cover all of Gaza’s needs for one month. Médecins Sans Frontières also runs a psycho-medical programme in Nablus, Hebron and East-Jerusalem. The organisation has been working in the occupied Palestinian territories since 1989 and in Gaza since 2000.